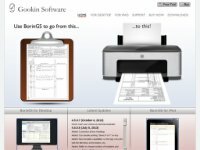 Gookin Software is the developer of 2 civil engineering softwares currently listed at CESDb. Please visit developers website for software support, product updates, licenses and other information about BorinGS for iPad, BorinGS. Enter soil boring log data right on your iPad using BorinGS. BorinGS for your iPad combines the ease you enjoy using the desktop version with the portability of your iPad.